The Vulcan BLENKINSOP Shoes have a conventional design that incorporates many necessary modern day features. The Vulcan BLENKINSOP shoes come in a true front pattern that helps eliminate some issues caused by the "one-style-fits-all" shape of many kegs shoes on the market today. The shape of the BLENKINSOP allows farriers to achieve a better fit more quickly because the shoe is designed to fit around the coffin bone will few alterations, meaning the widest part of the shoe aligns with the widest part of the foot quite well right out of the box. 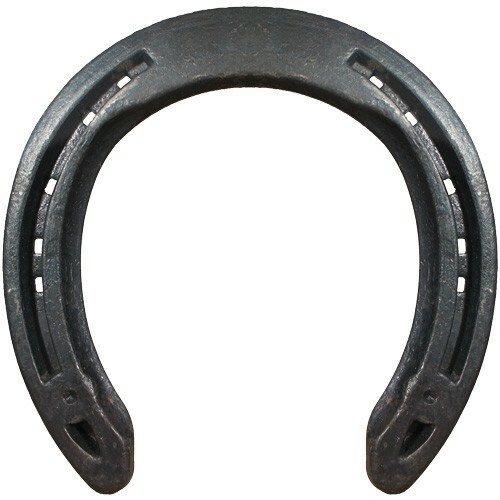 This shoe features an well designed ROLL in the toe of the shoe that continues around towards the quarters, offering the much needed Leverage Reduction required for many equine athletes today. The Vulcan BLENKINSOP Shoes are used for a wide variety of disciplines including dressage, hunters, jumpers, and western performance & english show horses. Because of the support, traction and durability of the shoe, they are a good choice for trail and other pleasure horses. In cases of minor lameness issues caused from excessive strain, leverage, and/or hoof distortions, the VB shoes incorporate many features that have proven to help relieve or overcome these lameness problems.